With “National Preparedness Month” (NPM) a little more than a week away, the H1N1 flu could make September a real-life ‘teaching moment’ on the importance of emergency preparedness, according to Ready.Gov’s acting director Becky Marquis. I spoke to Marquis at FEMA headquarters on Thursday to preview some of Ready’s plans for the Month. The NPM’s kickoff event will take place September 2nd in New York’s Times Square featuring Homeland Security Secretary Janet Napolitano and local Citizen Corps Council members who will be passing out preparedness and volunteering information as well as hand sanitizer. It will also be the launch of a new series of national public service announcements being produced by the Advertising Council, which will be localized in some cities. Ready will be producing and distributing a NPM multimedia web package on preparedness along the lines of the new social media content now being created by FEMA and DHS. 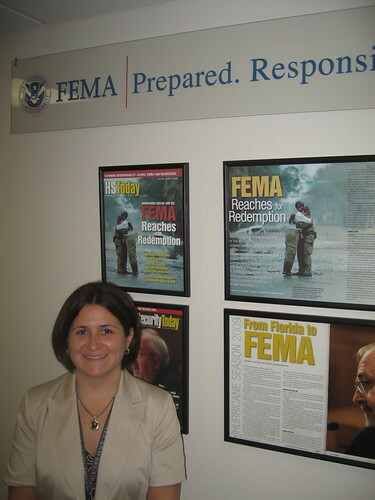 It will include videos from Napolitano and FEMA Administrator Craig Fugate on the subject of preparedness emphasizing theÂ “shared responsibility” and the public as “an asset” themes they have discussing publicly in recent weeks. Updates will be sent through the ReadyDotGov Twitter feed throughout the Month. Another focus will likely be H1N1 preparedness and response, said Marquis noting that “National Preparedness Month could become H1N1 Preparedness Month.” She said that Ready.Gov (and NPM) would likely be a significant part of the government’s public information response. I also asked Marquis about the little-noticed congressionally-legislated organizational and geographical move of Ready.Gov from DHS (and its upper Northwest Washington campus) to FEMA (and its offices near the Mall) late last year.Â She said that the transfer has turned out to be a positive development for a couple reasons: first, there are more public preparedness resources and activities at FEMA which she can draw from for Ready. And second, there are more external relations staff to help provide support for the program — that’s particularly important around this busy time since Marquis is Ready.Gov’s only full-time employee. For more information on National Preparedness Month go to www.ready.gov/america/npm09/index.html.Â There is a state-by-state event calendar on the siteÂ here. If you would like to be part of the NPM Coalition (which currently has 2,225 private and non-profit members), you can sign up here.